Sounds like someone is starting to throw out some excuses! Arriving at her new college, Beca (Anna Kendrick) finds herself not right for any clique but somehow is muscled into one that she never would have picked on her own: alongside mean girls, sweet girls and weird girls whose only thing in common is how good they sound when they sing together. When Beca leads this a cappella singing group out of their traditional arrangements and perfect harmonies into all-new mash-ups, they fight to climb their way to the top of college music competitions. Pitch Perfect is an outrageously hilarious laugh-out-loud comedy that also stars Anna Camp (The Help), Brittany Snow (Hairspray) and Rebel Wilson (Bridesmaids). This one I enjoyed quite a bit. Though I have seen better...still above average. The main thing I didn't like here is there is a little gross-out humor. Which is a type of comedy I never liked. Without that I would have rated this one higher. But I liked the story line and liked the characters. Definitely worth the time put in to watch it. 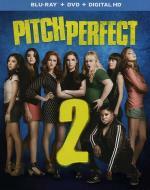 Beca (Anna Kendrick), Fat Amy (Rebel Wilson) and the Barden Bellas are back to pitch slap the world! After a scandal threatens to derail their last year at Barden, the three-time defending champs worry that they've lost their harmony for good. With one chance left at redeeming their legacy, they must face off against the toughest competition on the planet: German supergroup Das Sound Machine and fight for their right to win at the World Championships of A Cappella. It will take the power of sisterhood to find their voice and see what it takes to be the world's top pitches! I'm always surprised when I am able to say this... but I enjoyed this one more then the first one. Really it is just more of the same... except they did away with the gross-out humor. Which in my eyes is an improvement over the firs film. I feel comfortable recommending this one. It is worth the time put in to watch it. Featuring clips from all 10 films Fred Astaire and Ginger Rogers made together, from 1933's Flying Down to Rio to 1949's The Barkley's of Broadway, this glorious salute captures the sweat, determination, inspiration, talent and scintillation chemistry that made the team an icon of elegance in motion. Candid photos, behind-the-scenes tidbits and sidelights about such famed Astaire-Rogers collaborators as Irving Berlin, Jerome Kern, George Gershwin, Hermes Pan and George Stevens add to the fun. Take some gliding, sliding, tapping, twirling steps back in time with Astaire and Rogers Partners in Rhythm. Fine little retrospective look at the partnership of Ginger Rogers and Fred Astaire, featuring a bit of biography of each but mainly focused on their RKO career together. Brief, but worth a look for fans of the duo. There's still nobody out their like Fred & Ginger. Everyone feels a connection with Gene Kelly. He's a guy's guy to men. To women, he's a knight whose shining armor is a T-shirt and khakis. And he solidifies that link with a vigorous, athletic way of dance he calls American Style. Gene Kelly makes us all fee like we should be dancing and singing in the rain. The life and career of this innovator whose work includes Singin' in the Rain, On the Town and An American in Paris are recalled in this study of the driven genius - often narcissistic, always a perfectionist - who reenergized the movie musical and redefined dance on screen. 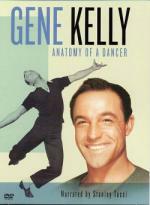 Packed with marvelous clips and interviews with family and Hollywood colleagues, Gene Kelly: Anatomy of a Dancer is the definitive look at a magical talent whose story has never been fully told until now. A really nice biography of Kelly and retrospective of his career. Kelly is not only an icon of dance, but an icon of the American film. Quite thorough and worth a watch for fans of his. CATS the longest-running musical in Broadway history, the show that changed the face of modern musicals – now as you've never seen it before...and as you'll never see it again! 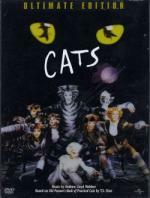 This ultimate home video version of the Olivier and Tony Award-winning classic boasts an all-star cast headed by Elaine Paige (London's original Grizabella) and Sir John Mills, with music performed by an eighty-piece orchestra. From the opening dance number to the final refrain of Memory, you'll want to experience Cats – Now and Forever! I used to have this soundtrack on cassette. Of course, I upgraded to CD a long time ago. I can sing along with every song - except the Rumpus Cat song, which isn't on the soundtrack. So, for everyone who will never have the opportunity to see this on Broadway (in other words, everyone like me!) this is great. Yes, the story is exceedingly thin. After all, it's all about the competition between cats to be the one picked for the Jellicle Choice, so it's a showcase of each individual cat. Actually it's a showcase of T.S. Elliot's poetry and Lloyd Webber's music, and a triumph of musical theatre. Highly recommended. Pete still needs a review for The Pajama Game and I still need reviews for Begin Again and Buena Vista Social Club. I still needs a review for The Pajama Game & The Wizard of OZ and Danae Cassandra still has to do reviews for Begin Again and Buena Vista Social Club. Fabulous music, groundbreaking animation, and one of Disney's bravest and riskiest films. If all the sequences aren't evenly fabulous, there are ones that stand up as absolute classics 77 years after this first came out. My personal favorite is "Night on Bald Mountain," but there is something to be said for all of them. I just wish the introductions weren't there, or just announced the piece of music. They're completely unnecessary. Boy is that overview misleading though! If by "the way Walt envisioned" you mean sanitized for your enjoyment, then yes, yes it is. Sunflower & Otika are still missing, and they were in the original Walt made. Gad I really hate censorship. 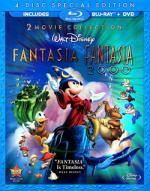 This is not only a worthy successor to Fantasia, it's one of the very best Disney sequels. In many ways I like it better than the original. If for nothing else than the introductions are both shorter and better written. The computer animation lacks the warmth of the original's hand-drawn drawn, but some of it is so spectacular as to make that a minor criticism. "Pines of Rome" and "The Firebird" are my personal favorites, though "Rhapsody in Blue" comes in close behind for a lovely trifecta. Recommended if you enjoyed the original film. Pete still needs reviews for The Pajama Game & The Wizard of OZ and I still have to do reviews for Begin Again and Buena Vista Social Club. Labor and management at the Sleeptite Pajama Factory aren't sleeping much lately: a proposed 7 1/2 cent hourly wage increase is why - and a strike may result. But negotiations here involve snappy stars, terrific tunes and dynamic dances as Doris Day The Pajama Game. I found this one to be a fun film... even if it is not what I would call a great one. It has a good story line. And while I liked Doris Day's character... I really had mixed feelings for John Riatt's. Through some of the movie I liked him.. but yet at some point I really stopped caring about him. Worth the time put in to watch... but it is not one I will be in a hurry to upgrade. 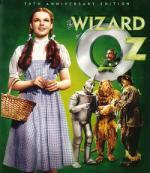 Jack Haley (1898) as "Hickory"
Whisked away by a swirling tornado, 12-year-old Dorothy, her dog Toto, and even her Kansas farmhouse, sail over the rainbow and into the dazzling land of Oz. Filled with playful Munchkins, enchanted forests and endless surprises, this dream-come-true world is one great adventure after another. But the most wondrous adventure of all begins when Dorothy and her newfound friends go in search of the kingdom's mysterious Wizard and the secret that will lead her home. This one is a true classic... though one that has been played through-out my life. As I remember it becoming an annual thing of the family all watching it together. But it is a fun movie with a great cast. Well worth the time put to watch it. A small town singer, Ali (Christina Aguilera), moves to the big city for her chance at stardom where she is enchanted by Burlesque, a glamorous nightclub packed with dancers, sizzling music, and an owner in need of a star (Cher). Jam-packed with visually stunning musical numbers and an all-star cast featuring Eric Dane, Kristen Bell and Stacy Tucci. While the story line was pretty good I found I just didn't care about the characters. And neither Cher or Christina Aguilara impressed me at all here. No more then an average movie at best. So not one I will be recommending or adding to my collection any time soon. I still need to review Shrek: The Musical and Danae Cassandra still has to do reviews for Begin Again and Buena Vista Social Club.